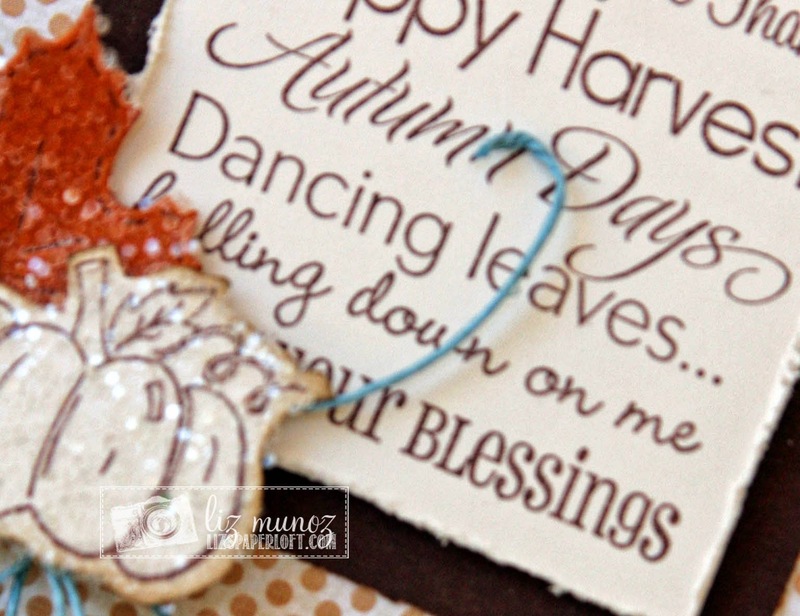 Liz's Paper Loft: MCT Designer Challenge ~ Dancing Leaves! Happy Thursday friends! 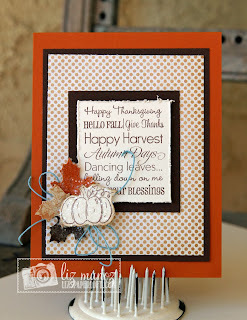 Today over at My Creative Time it's Designer Challenge! The challenge is to make something with a pumpkin on it. Before I get into telling you about my card, I wanted to apologize on not being around lately or visiting your blogs. With my daughters upcoming wedding it not only takes some of my crafting time. It's been using a lot of my creativity too! :) Ok enough of me! 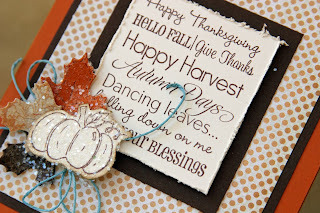 One of my favorite decorating blogs gave me inspiration for this card. The project she made was actually a picture, I took the same concept to make a card. I used a distresser to rough up the edges of the layer with the words. Of course no project of mine would be complete without some chunky glitter and hemp! 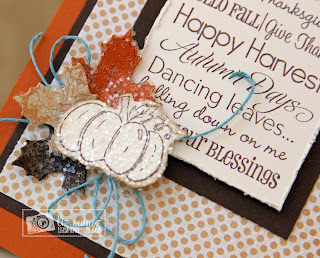 I've been loving the look of white pumpkins so purposely left in the color of the paper. 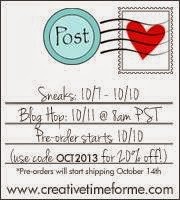 Be sure to stop by My Creative Time to see what the other gals have done!!! Next week it will be My Creative Time's 27th Release...ooooohh I can't wait for you to see it! Your card is so beautiful. I love how you used all the stamps what a unique and creative idea I love it never would've in a million years have come up with this. You are good really, really good. Love the colors you used and the shabby chic look and of course your hemp just the perfect touch. Girl I don't think you've skipped a beat with your creativity at all you definitely rocked this challenged and did it with passion and it shows. Another white pumpkin lover :D Your card looks wonderful with the stamp in the frame. I love the glitter and twine. Wonderful card. Good luck with the upcoming wedding...they are a lot of work. this is beautiful Liz! Awesome card!!! WOW! Love this! Love the center piece,the blue hemp twine and the glitter on the pumpkins!! Liz I love your card. I'm hoping you will see this question - what type of adhesive do you use for your chunky glitter? I have always loved that you use it but not sure what kind of glue. Good luck on the upcoming wedding. I'm sure it will be beautiful and FULL of creativity! Thank you so much for your sweet comment! Of course I will see your question, I always read all comments! For larger pieces I use my small xyron, inserting it upside down so the sticky is on top. If it's just around the edge I use zig 2 in one glue, however since it's blue I use it sparingly. For the pumpkin, since it white I used the xyron. I hope that helps you in your crafting adventures! Liz ~ well you know I ADORE your style! Always so elegant and put together PERFECTLY! LOVE the sentiment you used with the PERFECT dies! That chunky glitter is so fun and I LOVE my Zyron ~ use it as much as possible! Have a great day!